Binoculars are an optical equipment that allows you to capture stunning visuals while observing distant objects and focus on them to bring them as close to you as possible. They are generally constructed using two small telescopes attached side by side to provide you with the ability to zoom-in on things located far away from you and still be able to visualize their intricate details. Binoculars tend to overcome the limitation of a telescope to view or focus on things through one eye because they let you do that using both your eyes simultaneously. Here, we help you understand what a 10×50 binocular is and also provide you with a detailed review of how to find the best 10×50 binoculars for yourself. A big advantage of using binoculars is that their small size makes them portable for you to carry around while traveling or taking part in outdoor activities. Binoculars are ideal for bird watching, wildlife viewing, nature observation, hiking, hunting, stargazing, sports viewing, and several other outdoor adventures. Not everyone is a fan of compact, lightweight binoculars because they lack in quality and clarity. However, to achieve better clarity, the binoculars have to become a bit bulkier and heavier, but you will be able to see a lot clearer. With the help of 10×50 binoculars, you will be able to do just that, but with the addition of a bit more weight and size. If this sounds like a good trade-off to you, since you will be stationary or you favor larger binoculars better, then read on as we have reviewed a few 10×50 binoculars below that we know you’ll love. There are many different types of best 10×50 binoculars available which makes it hard for anyone to choose the right one for them, especially if they aren’t experienced. We recommend that you look for a few things when choosing your binoculars, including features, quality, and price. We realize that it may be hard for you to choose one binoculars when there are so many available, so if you are stuck, choose one of the products we review below as they were the ones we selected out of the many available because they excelled in features, quality, and value. What is meant by 10×50 Binoculars? To find the best 10×50 binoculars for yourself, it is important for you to understand what 10×50 really means. The figure of 10×50 refers to the optical configuration of a pair of binoculars. The two numerals represent two distinct entities or performance measures. The first of them refers to the magnification power of the binoculars and the second refers to the diameter or width of the objective lens used in them. This simply means that in a 10×50 binocular, 10 refers to 10 times magnification power which implies that the binoculars have the ability to make the existing image appear 10 times larger than its actual size. The second number 50 refers to the diameter of the objective lens used within the binoculars which is a critical parameter in determining the amount of light that is allowed to pass through the lens and enter your eyes. What to look for in 10×50 Binoculars? 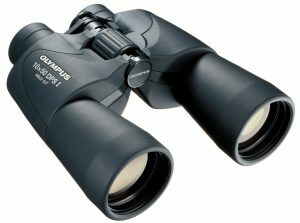 There are some technical terms which you will need to know before choosing the best 10×50 binocular. Let us help you sift through some of the essential factors that require your due consideration before you find the best 10×50 binoculars. Magnification allows you to zoom in and out on distant objects as smoothly as possible and continue to focus on the subject regardless of the fact that it is stationary or moving. Higher magnifying power means that you will be able to magnify and focus on distant visuals more clearly. But you need to be aware of the fact that the level of magnification or zoom achieved by a pair of binoculars can have a serious impact on the amount of light gathered and retained by it. In short, the more the magnification power, the less is the brightness of the image. Therefore, you need to make sure that you strike a balance between magnification and brightness levels of the visuals which you wish to capture. The diameter, width or size of the objective lens used in a pair of binoculars is a very critical parameter and is known to determine the overall light transmission and retention rates of a pair of binoculars. In simple words, the greater the diameter of the objective lens, the broader will be the generated field of view. This wide field of view results in an inherent increase in the brightness of the resulting image because eventually more light is being allowed to pass through the binoculars. A bright, crisp and clear image is what you need from a pair of binoculars. Visual clarity is one of the essential features that you need to ensure in a pair of binoculars. Without optimal visual clarity, the binoculars are of no use even if they are laden with one of the most powerful lenses, prisms, armor, etc. The clarity and quality of the images produced by a binocular ensure that the view remains as surreal as it really is. If a pair of binoculars can fool you into believing that you are looking through your own eyes rather than a set of lenses, then such a binocular is a must have. While using your binoculars, you will most definitely encounter situations where you wish to observe and focus on your target but the surrounding environment is poorly lit. For you to still be able to capture stunning visuals in such low light conditions, it is important that your pair of binoculars delivers an excellent low light performance. For this, you need to make sure that the binoculars magnify not only the image but the ambient brightness as well. The overall optical quality of the components being used in a pair of binoculars needs to be maintained for a flawless result. It is important for you to ensure that the optical lenses and prisms are made out of best quality glass. The better the quality of the optical components used, the lesser is the amount of distortion, dispersion or reflection of light. This ultimately results in a super high-quality image. Lens coating is an essential parameter while comparing multiple 10×50 binoculars. Lens coatings are necessary to smoothen the air-to-glass surfaces within a pair of binoculars and prevent those surfaces from getting scratched or dirty. Also, a smooth surface results in the elimination of all kinds of irregularities and further helps in keeping the surface clean and shiny. Exit pupils are like windows that simply allow the light to enter and pass through the binoculars. The larger the size of the pupil, more light is allowed to pass through the binoculars resulting in a brighter image. Close focus is a parameter that refers to how close you can focus on your target using a pair of binoculars. Other features include the need for your pair of binoculars to be waterproof, fog proof and dust proof since they are an essential outdoor gear. This will enable you to freely use your binoculars even under harsh weather conditions. 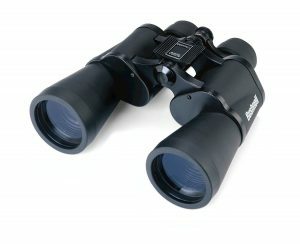 Here is a list of some of the best 10×50 binoculars that are quite popular as well and are indeed worth your time and money! If you are going to be stargazing, bird watching, or even spectating a sports game, this binocular will be able to suit your needs. Although not the most budget-friendly, this affordable 10×50 binoculars have built-in features to make your view clear and bright for you to enjoy. As the optics are wider due to the size of the lens being larger in diameter, more light can enter through the lens, making your view a lot clearer. As the optics also come with built-in UV protection, your eyes and viewing experience won’t be affected. This product is also recommended if you want a pair of binoculars with a wide FOV because you won’t be able to see much if you have one with a tight FOV. Usually, products with this magnification have tighter FOV, but with this binocular, you’ll have access to a wider FOV which will let you view a lot more and find what you are looking for easier. The quality of this product isn’t the best, but it isn’t the worst either. It can last a long time if you take good care of it and don’t drop it often, as the coating on the outside can protect it from minor damage. Overall, this product is recommended if you are looking for an affordable pair of binoculars that will provide you with a clear and wide FOV view. If you are on a tight budget and you are looking for a budget 10×50 binocular, then this product is something that you should take a closer look at. Although it still gives you HD clarity and high magnification, it is quite affordable and recommended to those on a budget. These binoculars are great to take on any activity you participate in because of its portability and affordability. 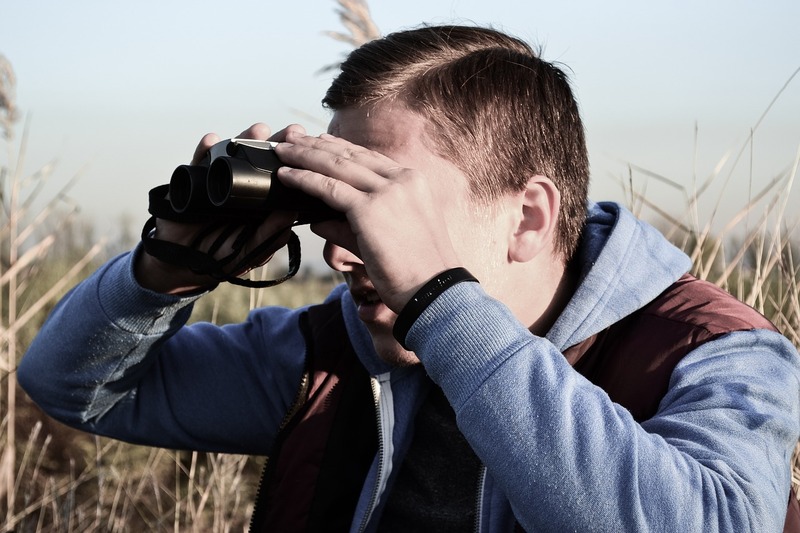 As this binocular isn’t as big or heavy as the other products in this list, you won’t have to worry about the binoculars weighing you down or the price makes you use the binoculars with more caution. The quality of this binocular isn’t the best as it is a budget product. However, if you don’t drop it from a high place or scratch the lens, then you should be able to use this product for quite a long time. This product also comes with rubber armoring that will help a bit with drops, but it won’t be able to survive a lot of drops, so we recommend that you be careful with it if you plan to use it for a long period. Overall, this product is great if you are looking for HD clarity along with portability while staying on a tight budget. 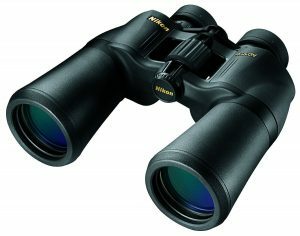 If you have a flexible budget, then going for a more premium 10×50 binocular is highly recommended. This is because you get access to a pair of binoculars that has great quality, clarity, and value. By investing a bit more upfront, you’ll be able to use your binoculars for a longer period, making it a better buy for the long run. One of the best things about this binocular is the optics, as this binocular will use as much light around you to make the image you see a lot clearer. This binocular also comes with a few ergonomic features such as the grip and eyecups to let you use these binoculars for a long time without feeling fatigue in certain areas of your body where you are touching the binoculars. 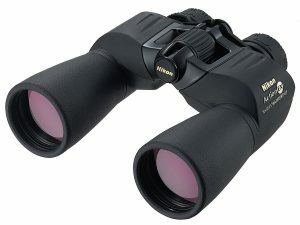 The quality of this binocular is more on the higher side mainly due to the price of the product. As this binocular is a bit more expensive, it is built to last a lot longer and can even last a lifetime if you take good care of the binoculars and don’t drop it often. Although shock absorbing rubber armor surrounds it, it is still recommended that you be careful with it to prevent any scratches on the lenses which will ruin your experience. Overall, we highly recommend that you get the Nikon ACULON binoculars if you have the budget for it because you’ll get better definition, better quality, and use it for a longer time. Nikon Action Extreme 10×50 ATB Binoculars can most definitely be considered as one of the most popular All Terrain Binoculars in the market. This pair of binoculars is definitely a powerful beast given that the optical components used within it are of super high quality and resulting optical performance achieved is spectacular. With an optical configuration of 10x magnification power and a pretty wide objective lens with a diameter of 50 mm, these binoculars are a killer under normal conditions and perform excellently under low light conditions as well. The use of Porro prism in this pair of binoculars makes it super lightweight and compact without hindering the overall optical performance. This pair of binoculars is environment-friendly as well because it makes use of lead and arsenic-free Eco-Glass for its lenses. These best-budget binoculars are completely waterproof and fog proof as well and can definitely be considered as the best 10×50 binoculars on the market currently. The excellent low light performance is quite frankly a cherry on top which is achieved due to the presence of large exit pupils of 5 mm. This results in spectacular imagery even in pitch black darkness. Because of the all-terrain functionality, weatherproofing, and excellent low light performance, these binoculars are considered to be perfect for outdoor activities such as wildlife viewing, hunting, hiking, etc. If you are using binoculars often in low-light locations, then you may have realized that your vision becomes a lot blurry and that is mainly due to there not being enough light to give you a clear view. However, with the help of larger lenses, your binoculars will be able to collect more light and give you a high definition view, even at night where there is barely any light. Now that you are aware of the factors you need to consider for purchasing the best 10×50 binoculars along with some of the most popular 10×50 binoculars, it should be pretty easy for you to figure out the right pair of 10×50 binoculars for yourself. Also, you need to be aware of your needs and the actual purpose of using a pair of binoculars, before making a decision about which ones to buy. We recommend that you look at the products we recommended above and choose the one that fits your needs the best, as we know you’ll love it and never go back.